After a wild, wet and windy day, spent indoors on the sailboat yesterday, playing board games, reading, blogging and watching tv, I was most ready to get out for a run this morning when I woke up and saw patches of blue in the sky through the porthole above my head. 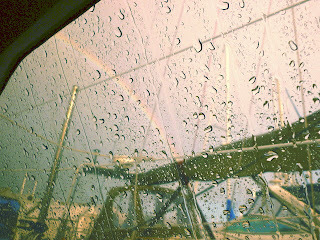 There was even a rainbow overhead so I knew the rain on the windows was just a remnant of yesterday's storm. I drank a cup of coffee and scarfed down a Wasa cracker slathered with chunky PB and strawberry jam, and then paced for about half an hour till we could get going. It was a quick 4.85 km and I was so happy to be outside and moving. We ran an out-and-back route with the turnaround being near a local McDonalds. The Captain ran in and picked up a newspaper, while I was having a one-minute walk break at the turn. He caught up with me easily and we chattered about plans for the rest of the week while we ran. It was all over with way too soon. But I really enjoyed my stretch and standing leg lifts while I cooled down. Afterward, after drinking a few glasses of water, we had re-runs on the Wasa and PB&J, and then showered. A few hours later, after lunch, we drove downtown. I was feeling lucky in the mail department and was pretty sure that at least one of the three parcels I am waiting for would be there. And I was not disappointed! The Recovery Socks that I won from One Tough Cookie and a Beer were waiting for me. Wahooo! I ripped open the package and admired them during the drive back to the marina. As soon as we got back on board, I put them on... and that is not an easy task, let me tell you. 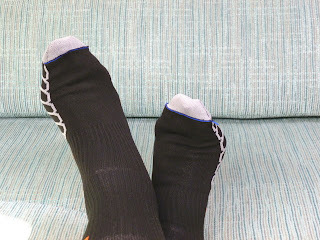 If you have ever been fortunate enough to have compression socks, you will know what I am talking about. But so worth the effort. I am so sure that they are going to be as good for me as they FEEL like they are good for me. Thanks, so much, Jill. I love these socks. Thanks to everyone who has been so suportive and encouraging and forthcoming with information and advice in answering my questions and concerns about training for the local Spring half marathon. I am so excited for you as you get more and more into running -- I'm extremely jealous of the compression socks and hope to win me a pair, too!! Nice run and great score on the socks! you'll love them! I love getting fun stuff in the mail that I won on blogs! I love my compression socks, they feel so good on the legs. Great job with the run! yay!!! i LOVE compression socks! so glad you now have your own pair to use! What a beautiful site to wake up to! I think I will have to give the compression socks a try, between my knee and plantar on my left leg, I need some help!! Getting out to run at all is an awesome feeling, and 3 miles is a great run!! You've convinced me to give recovery socks a try. I have never tried compression socks, but it seems like people really like them. I may have to get a pair! LOVE my Recovery Socks! they last forever!!! Keep up the fab running work!